There is an issue when using the 'sfweb2lead_webform' module on a webform other than the default webform content type. Basically the Salesforce Settings only show up on the default Webform content type. 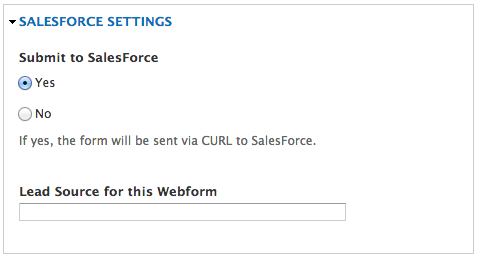 Below is an image showing the Salesforce Settings when editing a default Webform. The problem arises when you create a new content type and set it to also be a webform. Something you can do on the Webform settings page (/admin/config/content/webform). To enable the Saleforce functionality on a new Webform content type I ended up editing the 'sfweb2lead_webform.module' file (yes I know hacking modules isn't good practice). Firstly I'll show the bits you will need to edit, and secondly what they will be once you've added your new webform content type. For this example lets say I have a new Webform content type with a machine name of 'download_form'. // Handle editing of webform nodes.